American merchant / advertising token for Green River Whisky featuring black man and horse on obverse and good luck symbols on the reverse. This is one of possibly over 20 varieties of Green River Whisky advertising / good luck tokens issued after 1934. 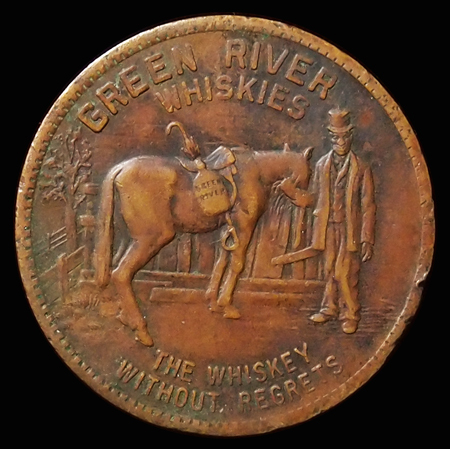 We can place the minting of this token as being after 1934 because the rights to Green River Whisky and the name Green River were bought by Oldetyme Distillers Inc. of New York on July 2, 1935. Since Oldetyme Distillers is mentioned on this token, it stands to reason this token was minted after their acquisition of Green River from John W. McCulloch Jr. after his father's death in 1927. 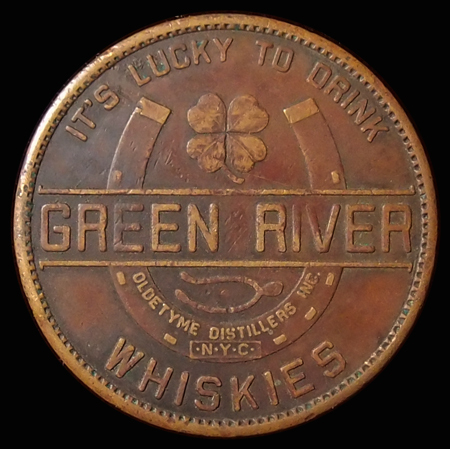 Green River Whiskey, by this time owned by Oldetyme Distiller Inc. of New York City, issued what may be the most famous and recognizable American merchant advertising tokens of the 20th century. These tokens are often categorized as lucky tokens because of the symbols that represent good luck on the reverse but, as they were advertised in magazines for magicians, they are often referred to as "Magic Tokens." There are possibly as many as twenty different varieties of these tokens but they all use the same basic imagery of the black man, horse, and good luck symbols. Some of the pieces have the product stated in the singular (Green River Whiskey), or as in the case of this example, it is referred to in the plural (Green River Whiskies). The story of Green River Whisky centers mainly on John McCulloch of Owensboro, Kentucky who began distilling Kentucky Moonshine Mountain Dew and his prize winning Green River Whiskey In 1885. 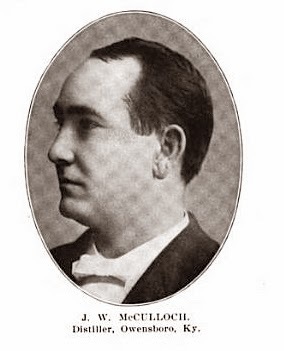 McCulloch initially worked for the Internal Revenue Service as a gauger testing the strength of whiskeys until he bought a distillery in which he once worked on the Green River near Owensboro in 1888. He incorporated as the Green River Distilling Company in 1900. McCulloch wasted no time and spared no expense upgrading his facilities, eventually building two U.S. bonded warehouses fully compliant with the Bottled-in-Bond Act of 1897, a detail he was quite proud of as for many it was a sign of a higher quality product. To be labeled as bottled-in-bond or bonded, the liquor must be the product of one distillation season (January-June or July-December) by one distiller at one distillery. It must have been aged in a federally bonded warehouse under U.S. government supervision for at least four years and bottled at 100 (U.S.) proof (50% alcohol by volume). The bottled product's label must identify the distillery where it was distilled and, if different, where it was bottled. 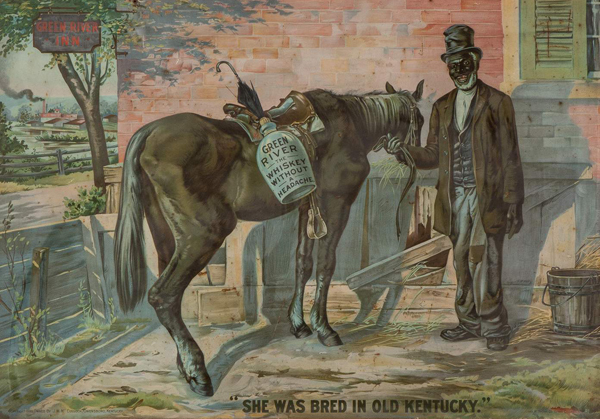 Although McCulloch marketed his whisky in advertisements (that features his family members, particularly his many children) and merchandising (particularly the black man and horse image), his main method of marketing his product was by entering it into competitions all over the country and internationally at fairs and expositions. The many awards he won is a testament to the quality of his product. In 1893 he won a medal for excellence at the Chicago Columbian Exposition, a gold medal at the Paris Exposition in 1900, the grand prize at the Exposition Universelle de Liege, Belgium in 1905, the grand prize at the World's Fair in 1904, the grand prize at the Louisiana Purchase Exposition in St. Louis in 1905, the grand prize at the Esposizione Internationale at Milan in 1906 and the grand prize at the Jamestown Tercentennial Exposition the next year. In this way he made it clear his whisky was world class. His whisky became so well known and revered that Ernest Hemingway, in his short story The Last Good Country, highlights Green River Whiskey and in 1906 Green River was awarded the contract to Furnish United States Public Health and Marine Hospital Service with Whisky for medicinal purposes in 1906. 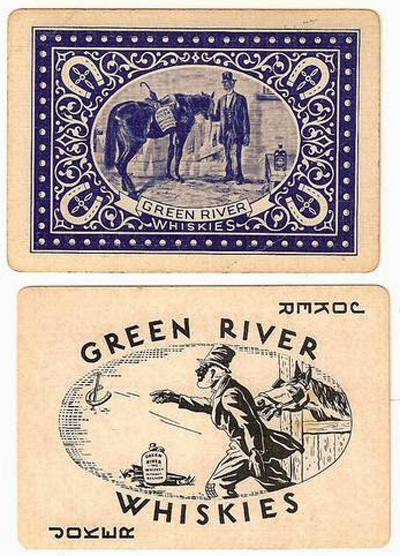 Certainly the most recognizable component of Green River Whisky marketing was the image of a black man dressed in a natty but worn suit, wearing a top hat and holding a horse that has a large jug of Green River whisky strapped to its side. This is the image on this coin and, although it is not shown on the coin, the original image on which the coin image is based shows they are standing in front of the Green River Inn and the Green River Distillery is visible in the distant background as shown below. McCulloch used this image extensively in his marketing, branding and giveaway items. This image may be seen as being racist or at least another example of an unfavorable depiction of black people in advertisement and certainly this argument has merit. Supposedly the inspiration for this imagery was a story told to him about a disruption in supplies due to a prolonged thunderstorm causing a local tavern to run out of whisky. The black man pictured supposedly braved the storm to deliver Green River Whiskey back to town on his mule. Kentucky was relatively split during the Civil War, and while McCulloch's exact views on race cannot be known, he played a major role in the Republican party as a delegate to the National Nominating Conventions for Kentucky and was an unabashed Unionist. McCulloch released thousands of special commemorative bottles of whisky in 1895 for the first Grand Army of the Republic (G.A.R.) Encampment, an organization of Union soldiers. The Courier-Journal praised him for the effort and said "doubtless thousands of old soldiers will leave Louisville, ready to endorse his whiskey anywhere." However, in 1912 his standing in Republican circles in Kentucky began to suffer as the party was increasingly dominated by Prohibitionists who took a dim view of purveyors of whisky, however fine it might be. He was not very popular with those who opposed prohibition either as he continued to raise money for the party which ultimately sided for prohibition. By this time McCulloch had become a powerful figure in Kentucky and received the highest title of honor that a Governor of that state can bestow. In recognition of his noteworthy accomplishments he was inducted into the Order of Kentucky Colonels. From that time on he was known as Colonel McCulloch. In August 1918 the Green River distillery caught fire. The headlines in the Owensboro Daily Messenger declares "Col. McCulloch Returns to Find Green River Gone," and further reported that "In Three Hours Every Building of Big Concern is Reduced to Piles of Ashes." In this fire McCulloch lost 18,000 barrels of aging whiskey with an estimated worth of 3 million dollars. The fire was not a complete loss and McCulloch rebuilt and began producing his whisky again but it could not last. The passage of national prohibition closed him down and he shipped off most of his stock, much of it to the Federally controlled "concentration warehouse" in Woodford County where it was bottled for medicinal use. Colonel McCulloch did not live to see Prohibition repealed and his distillery revived. He passed away in 1927 at the age of 67 near Owensboro. After the repeal of prohibition his heirs rebuilt the facility and began to produce Green River whiskey again for a short time until they sold the Green River label to Old Tyme Distillery of New York in 1934.